Dyche on diving: Give players an inch and they'll take a mile! Give a player an inch and they'll take a mile, says Burnley boss Sean Dyche. 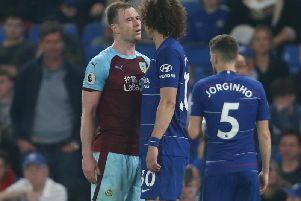 The 47-year-old has been expressive on the subject of simulation during his time at Turf Moor but at Thursday's press conference at the Barnfield Training Centre, where he addressed the media ahead of the Huddersfield Town game, he was as impassioned as he's ever been when discussing the topic. Dyche believes that examples of players attempting to deceive a match official are becoming more rife and nobody is doing anything about it. The FA had introduced a new offence last season, where players could face retrospective bans for 'diving', but the governing body seems to have kicked that directive to the curb already. With no retribution or no deterrent imposed to put a stop to this culture, players are trying their luck, taking a gamble, to see what they can get away with. “If you are going to sort the game out, stop cheating," he said. "End of story. Does everyone agree that the World Cup was a farce for cheating. Everyone must agree that. “I don’t care where you come from in the world, you must have sat there and thought ‘oh my goodness, this has gone crazy!’. “Now in the Premier League they dive and they don’t give anything. There’s no retribution afterwards, no FA charge, nothing. “It’s worse because now players will dive even more because they’re thinking they won’t get a free-kick against them or a yellow card, no charge from the FA, nothing. “Hence, have you noticed more and more people are going down again? The directive had the desired effect last time Huddersfield Town came to Turf Moor in the Premier League. Dyche slammed Terriers' substitute Rajiv van La Parra's dive as 'unacceptable' adding that it was 'as bad as I've seen' in the goalless draw. Fortunately retrospective action wasn't necessary with officials clamping down on offenders at the time. On this particular occasion it was referee Chris Kavanagh who wasn't duped by the Dutchman's behaviour and consequently brandished the yellow card. However, the former Wolves winger may have escaped punishment in the current climate and that's a major concern for Dyche. “It's just happening because no-one wants to deal with it," he said. "The worst that can happen is no card, no sanction, no players bother anymore, no fans bother anymore. “I can’t believe it, the beautiful game, cheating everywhere. “How can this be right and no-one wants to change it? “A kid cheats in his maths exam and you would go mental, yet you let them cheat on a football pitch which could cost someone their livelihood. “It’s at a farcical level and the World Cup was unbelievably bad. No-one does anything." Dyche added: “FIFA don’t want to touch it, UEFA don’t want to touch it, the Premier League don’t want to touch it because of the shiny product, ‘oh no, we don’t want that word cheating in the Premier League’. “I got told to stop using the word and I said absolutely not. I said because that’s what it is. “The irony is we’ve not had a penalty in the Premier League for 16 months. “I’ve sent 10 of them away, I’ve said our player clearly hasn’t dived and it’s a penalty. The referee is now looking for the dive to pre-suppose he’s been fouled. “No-one wants to touch it. The irony is you could turn it into a real positive if they said ‘we’re the Premier League and we’re not having it’. That’s a brilliant, positive statement to millions of children around the world. “There are so many good things in the game that you think why wouldn’t you clear this up? Let’s get rid of it." Desperate times call for desperate measures, according to Dyche. But with authorities washing their hands of the controversy he feels the situation will only get out of hand. “It cracks me up when you see a corner and they place the ball on the last strand of grass with white on it to gain four inches of a ball’s width," said the Burnley boss. “You allow them to do that and goal line technology, but you won’t stop something like cheating which is a massive margin. It’s a massive gain for a team. “Drogba is the first one I can remember and it was uproar. They were debating it on Match of the Day, saying this can’t carry on." He added: “I would never say our team is whiter than white because I can never guarantee one of our team wouldn’t do something like that. "But on a scale of one to 100 we would be quite near the bottom of the scale of people falling over. “There was one the other night, I nearly lost it. I nearly texted Mike Riley because it was that bad.